Distortion in art refers to the ‘incorrect’ or unusual representation of things when compared with traditional naturalist representation. This may occur as part of a stylisation process (for example, Burne-Jones, El Greco, Modigliani, etc.) or in order to meet particular expressive ends (for example, Moore, Bacon, Epstein, De Chirico). Any change made by an artist in the size, position, or general character of forms based on visual perception, when those forms are organized into a pictorial image. distortion. Condition of being twisted or bent out of shape. 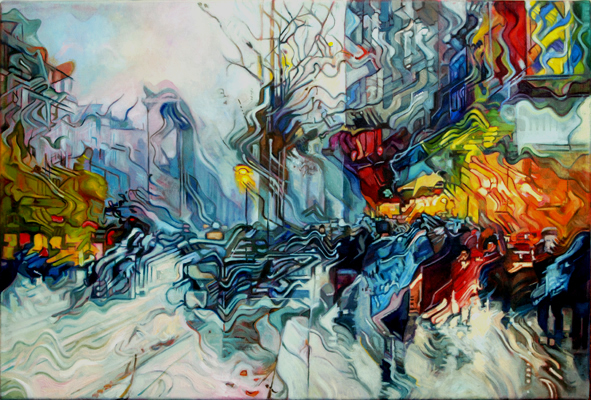 In art, distortion is often used as an expressive technique. dominance. The importance of the emphasis of one aspect in relation to all other aspects of a design. distortion - the modification and exaggeration of visual qualities to enhance expressive impact. MiMi.hu, 2011, Distortion available at http://en.mimi.hu/finearts/distortion.html, accessed 22 January 2013, still available 17 December 2016.